The legacy business model of the “general hospital” is one of the greatest contributors to the astronomical cost of healthcare. In the past, when most diseases fell into the realm of intuitive medicine, these institutions served as “...clinical laboratories where complex medical cases could be solved and unanticipated emergencies and complications could be resolved with as much certainty as possible.” Through scientific progress (much of it developed in hospitals), sustaining innovations have turned hospitals into extraordinary venues for managing the complex medical needs of patients. However, as a result, the organizations have overshot the needs of patients with straightforward diseases that have proven treatments. In the book, Christensen clearly outlines the issue with these institutions: “treatments that were on the frontier of medicine decades ago are still being performed in general hospitals rather than being handed off to lower cost, more convenient venues of care.” We will certainly always need hospitals to innovate the frontiers of medicine, perform clinical research, and train future caregivers; however, as stated by the authors, “we will just need fewer of them.” In this post, we will explore how hospitals have developed into a major financial drain on our healthcare system while defining a path forward for the benefit of patients. The current business model of the “general hospital” seeks to fulfill both of these JTBD. While this may be good for the bottom line of the hospital, here is why it actually is harmful to patients and the ecosystem at large. 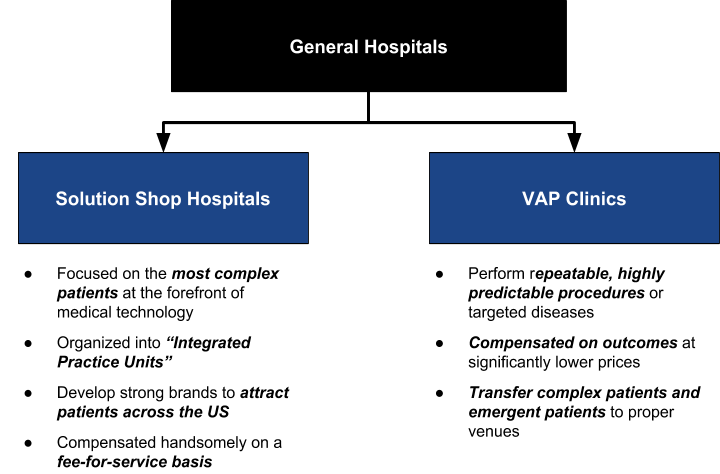 Conflicting Business Models: General hospitals have commingled the “solution shop” and the “value added process” business models into a single entity. (see Part I for definitions). The combination of these models results in conflict and complexity in the institution that drives higher cost and worse outcomes. Value Measurement: As we saw in the previous post, solution shops are designed to be compensated on a fee-for-service basis in order to effectively compensate for the time of highly skilled physicians and caregivers. Conversely, the VAP business, given its repeatable and predictable processes, should be paid based on outcomes (frequently at much lower prices). However, in the hospital, all services are generally paid using fee-for-service, making it impossible to truly price services according to the value they deliver. Specialist Decentralization: The form of thee solution shop business model implemented in many general hospitals is in itself sub-optimal as specialists are organized according to their area of expertise (e.g., the “cardiology”). However, most intuitive diseases sit at the intersection of 2 or more systems in the body. Rather than taking an integrated approach, this decentralized structure leads to unnecessary and costly complexity. Delivery Complexity: The challenges associated with the commingling of these two models result in an insane amount of overhead required to operate these institutions. Efficiency is nearly impossible. Massive costs are incurred as a result. Cost Absorption: Hospitals often spread these high overhead costs across all services in the institution. This incentivizes CEOs to continue offering high volume services (better suited for the VAP model) in order to spread these costs as much as possible. Of all the items above, #5 is one of the key reasons hospitals choose to continue operating in their current structures. However, it will be soon become clear that what is good for hospitals is not good for the healthcare system. What will the disruption of hospitals look like? They say the first step is always the hardest, and this is certainly the case when it comes to disrupting the hospital business model: breaking the business models of the solution shop and the VAP business apart. In large health systems, this can be done within the system itself. However, in more rural or community settings, general hospitals will, instead, need to focus on one of the models as there won’t be sufficient demand to satisfy both. In some cases, particularly in low population areas, the hospitals should go out of businesses with practitioners developing sustainable processes for transfer of complex patients. In solution shop hospitals, specialists will be organized into “integrated practice units” with providers from different specialties coordinating around a particular disease state (e.g., heart and vascular). This will both improve the quality and speed of diagnosis while providing a better experience for patients. The Cleveland Clinic, with its model of “institutes”, is a prime example of this change. While it has often been said that these types of institutions will not survive financially without the support of high-volume VAP procedures, recent history has proven this belief to be wrong. There are specialized hospitals popping up everywhere - focused on everything from heart issues to cancer care - and they are incredibly profitable. When organizations are designed to deal with only the most complex cases, then they have the ability to justifiably charge prices even higher than they do today. Because of the commingling of business models, the authors posit that solution shop services are being under-priced in today’s model. While this may seem like a bad thing for healthcare costs, remember that far fewer procedures will occur in these facilities due to the presence of VAP institutions. Value-added-process institutions, often known as specialty hospitals, will siphon off all of the high-volume, repetitive procedures that occur in general hospitals today. Their standardized process will allow them to continually improve their outcomes while also charging significantly lower prices compared to the general hospital. This is fantastic news for patients. The authors note specifically two objections that have been levied against VAP hospitals in the past. First, people are concerned about the ability of these institutions to handle emergencies. Secondly, these hospitals have been criticized for “cream-skimming” patients away from the general facilities that need them to support their business models. The only proper response to these objections is “yup - sounds good.” We can transfer patients with complex emergencies and these procedures should not have been performed in general hospitals in the first place. The pace of medical innovation will not be slowing down, so it is important that we continue to treat patients in the proper venue. Over time, as we learn how to predictably treat more diseases, solution shops should continue to focus on the most complex patients while transferring straightforward treatment to the VAP clinics. But who will disrupt the VAP model? Along with our understanding of disease, our medical technology is also continually improving. It is important that we develop products that can help move diagnosis and treatment out of the VAP hospitals as well. New business models around home care, primary care, and retail, if provided with the proper tools, can begin to move procedures to even lower cost settings. For example, the advent of the portable ultrasound machine allowed many more individuals to perform ultrasound readings. By enabling lower skilled, less expensive resources with these tools, we will meaningfully impact the cost of care while also maintaining high quality outcomes for patients.. This “disruption” will not occur quickly or smoothly. Hospitals are big entities that make a ton of money in their current model, particularly the large integrated systems. They also have a significant presence lobbying congress members to look after their interests. For example, given the “cream skimming” objection to specialty hospitals mentioned above, hospitals were actually able to get the development of new specialty hospitals banned through political action, though it was overturned several years ago. Instead, this disruption will be a “death by 1000 cuts.” Specialty hospitals for different diseases will continue to pop up and take certain procedures out of the hospital. Patient-focused, value-based primary care practices will manage their membership for wellness while also providing many services in clinics or at home. Patients will even gain access to more technology to support personal management of their conditions. Hospitals’ only choice will be to continue to narrow their focus on the most complex diseases while building a national brand to attract demand from outside their geographic region. As a result, many will fail or merge in order to stay alive. To me, this is one of the most necessary changes to our current business of healthcare to improve affordability. Routing patients to the proper venue of care can make a tremendous difference in both the cost and quality of the treatment received. I am entirely enamored by the guts of entrepreneurs taking on these behemoth entities, and I am certain that this will only accelerate over the coming decades. Hospital CEOs are going to have some hard decisions ahead of them. Coming up next, I will examine the next chapter in “The Innovator’s Prescription” focused on the disruption of the traditional physician’s practice. Stay tuned!